Imagine yourself on the terraces of the Maracana while you play this Brazilian football themed 5 reel. This online slot mixes the yellow and greens of Brazil with the flair and beauty of flamenco dancers. Match the symbols to win the jackpot and gain free spins and bonus rounds. All this available right here on Wizard slot games. 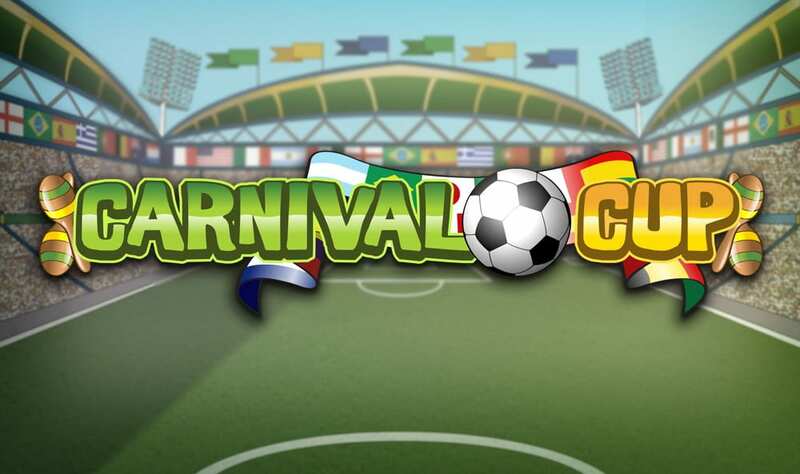 Cup Carnival was developed by Eyecon, a development team who are moving fast in becoming one the leading game's developer in the online slot world. This game, in particular, is quite a minimalistic compared to some of EyeCon’s previous games but nevertheless still fits in well with their repertoire of high-quality online slot games to play. This game from Eyecon fits the standard online slot bill with 5 reels and 25 paylines featuring across the boards. Fall into a trance at the sight of the deep purple background and its Brazillian football themed border and the logo of the game. Some gamers who are used to the more interactive video slots or games that have employed some sort of animation feature may turn their noses up at this game simply for its generic simplicity. But often these games are the hidden gems because of their user-friendly nature and big bonus offers. Bets can be placed for a minimum of a penny all the way up to a maximum bet of £60 and cater for a whole range of gamblers whether big-time or small-time minnows. We also have a list of the best UK slots online you can play here. As you may have guessed the game has a football-related theme and in short, is based on the 2014 World Cup finals in Brazil. Can you tell? The symbols on the game board consist of your standard numbers and letters for the lower-value filler symbols. In addition, you can also match up fireworks and trumpet symbols which represent the chaos of the Rio carnival. To really become a slot game that stands out from the rest you need to have some added bonus games and features that draw the gamer in. Thankfully, the team at Eyecon really know how to get the ball rolling and give the people what they want! 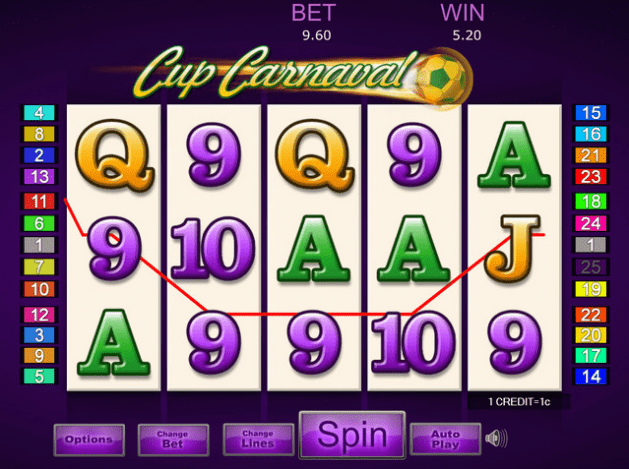 The Wild symbol throughout Cup Carnival is represented by the yellow and green football and when bouncing on reels 1, 3, and 5 it acts as a multiplier. Find yourself celebrating up to 20 free spins when you activate the scatter symbol which is the beautiful female model. Like many other games, you can also experience the gamble feature which is of a similar intensity to that of a penalty shootout. It’s a standard double or nothing gamble feature that can make you or break you on the world football stage. Do you have the minerals to keep your head alongside some of the best? For a wider range of our promotions please click here. Overall, Cup Carnival is an extremely intriguing game. Although its appearance isn’t necessarily the best thing since sliced bread it still has a range of bonus and gamble features that can put you on the board to win a whole range of free spins and cash prizes. This is a great game for the football lovers out there, or anyone looking for a user-friendly 5 reel. After this maybe you might go on another adventure with our jack and beanstalk slot?